You have changed my life in so many ways. I now think of pain as normal. I take more pills than I ever imagined possible. I had to give up work that I loved. And I've found myself struggling to pay the bills. I have days when I can't remember anything, when I drop things constantly, when I walk into walls. I have headaches, joint pains, endless unexplained illnesses. I've even had to have a hysterectomy. But, despite all that, I've learned to live with you. I've learned how to be happy with less, and even be happy despite pain. I've learned to appreciate the little things in life, and the things I am able to do. I've learned to slow down, and that the world won't come to a crashing halt if I do absolutely nothing. I've met the most amazing, inspirational people, who have achieved incredible things despite your attacks. 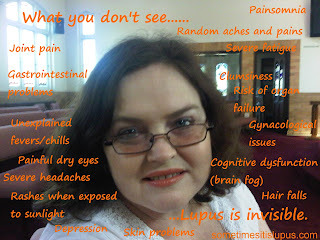 I have to say Lupus, I hate you. I would really rather you left and never came back. I hope and pray for the day that some finds a way to end your horrible behaviour for ever.